So sorry this is late publishing. It was scheduled to go live, but failed to do so. Maybe it was a nasty April Fool's joke. 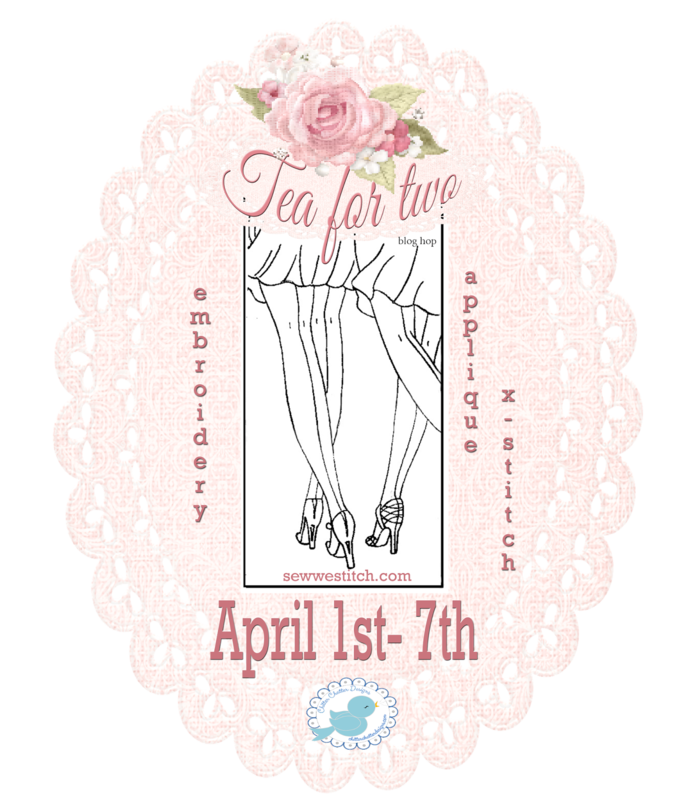 Although today is April Fool’s Day, it is no joke that we are kicking off our Tea for Two Blog Hop this morning. 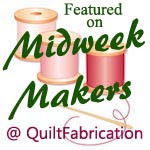 Thank you so much to Madame Samm who blogs at Sew We Stitch for coming up with another wonderful hop. Thank you as well to Cori who creates the most amazing designs for us to stitch. My take on this design included a multitude of techniques – applique, free motion quilting, embroidery and Brazilian embroidery. Now......please grab your cup of tea and join the rest of the participants in this hop. I am sure you will be inspired by what you will see. I'll leave you with a parting shot of my rose garden. I guess it is a wee bit late to talk about St. Patrick’s Day, but we always celebrate the day with the traditional corned beef dinner - corned beef, cabbage, soda bread, etc. Cabbage was at such a great price (four heads for a dollar) that I had to start another batch of sauerkraut in the crock. It should be ready in about 6 weeks! My mom brought alone some green peeps for me when she came for dinner. They went quickly, but aren’t they a pretty color? This week I managed to finish this month’s AYOS project – a wonderful wee sampler. I used some PB and J fabrics that I had in my stash. It was another great mini. Thanks to Sinta and Sherri we have great projects month after month and I love my minis for decorating. Along with working on my Two for Tea Blog Hop project (coming April 1st), I managed to finish up the Disappearing Hourglass quilt for my granddaughter’s upcoming 16th birthday. DH and I took a drive to check out the blooming wildflowers last week. There were so many beautiful ones – especially the poppies and lupine. 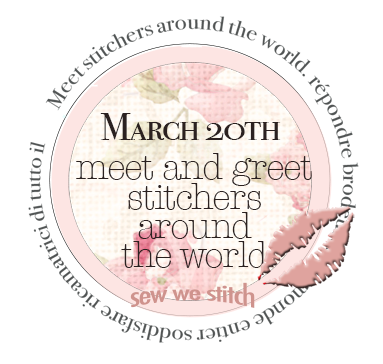 Today we are celebrating the first day of spring and a chance to meet stitchers from around the world. The call went out for hand stitchers to link up at www.sewwestitch.com with some of our favorite pieces. I have made Christmas stockings for the grandchildren as they came into our family. Many of them were made before I started blogging and I do not have photos of those, but here are some of the more recent ones. Some of the families have chosen to have the counted cross stitch stockings while others have chosen the felt embroidered ones. Most of the stitching I have done has been gifts, but I do have two pieces of counted cross stitch hanging in the house. They are both behind glass so please excuse the glare. I have been working on a nativity scene for the last few years. Each year I say that I will finish it, but right now I am working on one of the kings. Two more kings and then the shepherds and angels on the other side of the piece need to be done before I call it finished……maybe this year! Be sure to pop over to Sew we Stitch to find a list of all participants and to be inspired by some gorgeous work. Spring……and birds…..they just go together. I have always enjoyed watching the birds in our yard and enjoy watching the migrating birds return to the feeders each spring. This blog hop had my name all over it with the gorgeous bird fabrics – Tracy Lizotte for Elizabeth’s Studio. 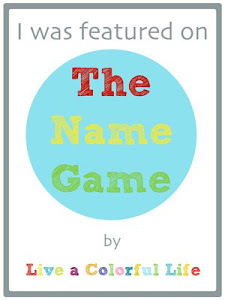 Thanks so much to Lana who is our wonderful "bird caller" and to Madam Samm for another exciting blog hop. 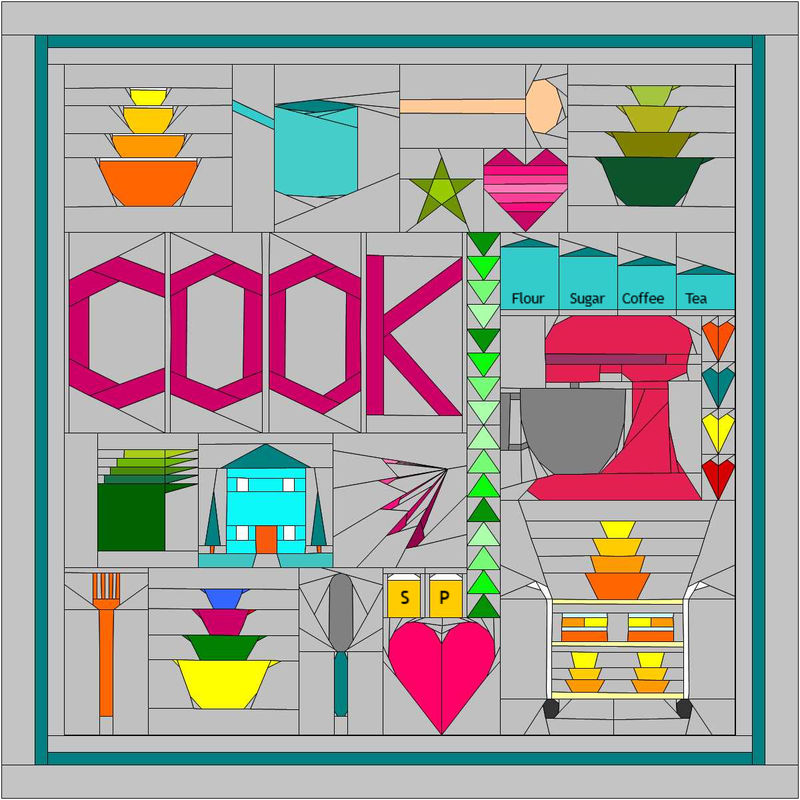 So….what did I create? Well......birds and birdhouses just go together to me. Of course this would not be an outside birdhouse, but a little storage box that I can use next to my favorite stitching chair. The fabrics were so beautiful and I wanted to do something that would show them off a bit more so I made a tote as well. This tote is a pattern that Stephanie Dunphy shares in her book, Uncommonly Corduroy. The body of the tote is made of corduroy and went together easily. My most recent issue of Stitch magazine had a wonderful bird mini quilt that I thought would be a fun one to make for spring. I did mine a bit differently, but I liked the way that the scraps worked up for the nest. Although I did not make this pillow, I thought I would share it with you. It just goes so well with the blog hop. Wouldn't it be fun and easy to make? I think little yo yo flowers would be perfect on it. Appliqued birds would be cute too. To celebrate the upcoming arrival of spring, I have a giveaway of a panel from these gorgeous fabrics. Just leave a comment and I will select a winner at the end of the hop. If you are a follower of my blog you can leave a second comment telling me how you follow. Thank you so much for stopping by today. Please be sure to check out the rest of the blogs for some bird inspiration. Happy spring! The signs are there! The migrating orioles returned this weekend. I’ve been expecting them with our record setting high temperatures lately so I was not too surprised to see one at the feeder. The males return first and the females will follow in about two weeks. The hummingbird numbers are also increasing each day. It was a busy weekend around here, but I did manage to get the blocks sewn together and the borders applied to the Disappearing Hourglass quilt. It went together very easy even though there are many bias edges to it. We had the children’s school auction this weekend and the doll uniform went really well, as it does each year. We celebrated a birthday with one of the grandsons yesterday. I was responsible for the cake. This child LOVES to put Tapatio hot sauce on everything so I did a cake that fit his likes perfectly. He got quite a kick out it. This has been a year where it seems like it is one sickness after another in the family. From talking to others, it sounds like it is not isolated to us. I am just eager to get it out of here and move on into the healthier summer months. Our 18 year old granddaughter has been in the hospital since yesterday on IV’s while they are ruling out appendicitis. We are hoping that it is not and she will be released tomorrow. I hope the warmer temperatures are finally reaching to the frozen areas and that the hope of spring is on everyone’s mind. For the granddaughter's 16th birthdays they have requested a new quilt - an upgrade from their baby quilts. We have a granddaughter turning 16 next month so I needed to get this finished. I decided to go with the Disappearing Hourglass pattern and the fabric line Amelia. The blocks are done and now I need to put them together before the big day. As I do each year, I made an 18" doll uniform for the grandchildren's school auction coming up this weekend. This item has gone for a lot of money over the past years. I'm glad it all goes to a great cause - their school. February caught me off guard and I did not get my monthly AYOS mini quilt done, but I did win this fabulous layer cake of Honey Honey by Kate Spain from an earlier AYOS project. I hope to get this month's mini completed. It looks like a great sampler project. You can join the fun as well. The information can be found on Sinta's or Sherri's blogs. We had a wild and wicked storm roll through over the weekend with hail, lightening, thunder and a real downpour. The lights flickered several times, but we did not loose our power. It was nice to get the rain as it will keep things green a bit longer here. The surrounding mountains are covered with snow so it remains a pretty sight. This was taken as the storm rolled in here. Would you believe that I actually picked my first rose of the year on February 27th? They are so early this year.